It’s the last day of our three-day Labor Day weekend today. I figured that calls for a celebration, as I rarely get to sit in my lazy chair on a Monday morning. My family loves crisp ‘Dutch Baby’ pancakes. We usually get them at our local pancake house, but since going out for breakfast is not within our financial constellation lately, I urgently needed to learn how to make these at home. What did I do before the Pinterest-era?! Seeing all those gorgeous Dutch baby recipes online, made me pause and ponder why they are called Dutch Babies in the first place. I can’t remember enjoying these in Belgium or Holland, so I’m entirely pointing my finger towards the Amish for having something to do with that… Let’s face it, doesn’t anything delicious come from the Amish?! Those folks know how to bake. Not to mention that they have access to farm fresh ingredients that haven’t been tampered with, and that they aren’t swayed by grabbing something off the grocery shelf real quick, because whatever. When I first came to the USA with my 2 suitcases, I lived a mere 2-hr drive away from the Amish country in PA, right by the Delaware Water Gap, in a tiny town called Blairstown, NJ. My then roommate & I would drive down in our weekends, and we’d load up the car with the most amazing jams and baked goods I have ever tasted. While I have to admit that I don’t fully understand their religion and culture, I recognize that the simplicity & ‘purity’ of their lifestyle brings forth amazing products. Apart from the many wonderful things I have learned from traveling all over the world, is to be tolerant and appreciate the best in each culture, and I thank the Amish for their contribution to my culinary journey, even if I’m completely wrong and they had nothing to do with the invention of this tasty pancake. This Dutch baby was wonderful sweet & tangy at the same time. I confess that I had never baked one before, so I got a bit jittery and skeptical, but it was truly that easy! Who knew?! I gave it my own twist by going Provence on this classic and infusing a citrus-lavender flavor directly into the batter. Place 2 Tbsp of butter in your cast iron skillet, and place in the middle of your oven. Then preheat oven to 425F, to get the pan nice & hot and the butter slightly brown and bubbly. In the meantime, blend eggs with flour, milk & almond extract into a smooth batter. Fold in lemon zest, orange zest, brown sugar and lavender blossoms. Take skillet out of the hot oven and pour in batter. Don’t stir! It’ll be quite runny, but don’t worry as it’ll puff up nice & golden in the oven. Bake pancake for approx. 15-20 minutes, until the edges are dark and crisped, and the pancake has puffed. Take out of the oven and let it ‘sink’ a bit. 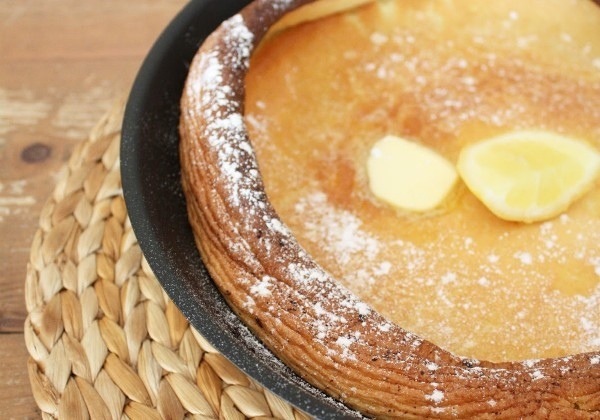 Squeeze half a lemon out over the pancake and sprinkle with powdered sugar. Serve hot.